I know the book by heart. I loved it so much as a child. Now I read/recite it to my students and we make life size paper sculptures of their inner wildthing. I cry during the trailer. Fri night…finally I’m off to see the Spike Jonze movie (it’s just opening) with friends to celebrate my b’day (Oct. 14th). My baby Henry is due soon and I have been saying all along that he can come early/whenever he wants so long as I get to see the film. Well here we are. He’s not here yet. 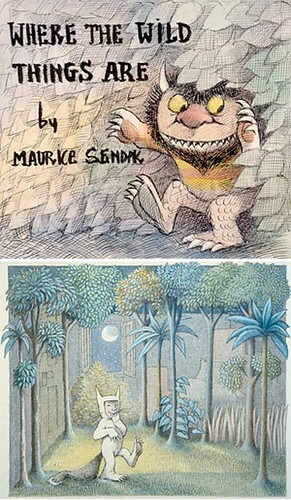 I’d also really like to visit the Morgan Library/ Museum, a beautifully renovated old library in midtown Manhattan (we used to frequent when we lived nearby) that has an exhibit of Maurice Sendak’s original drawings/ manuscript from the book including the ones above. I hope you see the movie, re-read the book and get in touch with your inner wild thing by making some mischief! Have a beautiful weekend. XO. Dear Henry will come soon enough, enjoy your time while it’s your own! Our Niko arrived last month on the 19th of September, 10 days late after 29 hours of labor. It was (and still is) an intense and amazing experience! Wishing you a safe and easy (as easy as can be) delivery. You have all my best vibes! Thanks so much Mac. I saw the beautiful baby photo on your blog and of course the stunning nursery. I would have expected no less. I’m nervous about labor but will try to go natural if I can….hoping it’s not 29 hours! Wow, you really did an ultra marathon. You have a beautiful result though. Thanks so much for the well wishes! XO. Thanks Yasmine! Just got back from the movie. Loved it!!!!! You have to see it. I tried really hard to go all natural. We had quite a bit of training with our doula for months before our due date, but labor proved much more intense than I was prepared for. I opted for the epi at around hour 23… it was the best thing I could have done because it allowed me to rest before having to push. I think I would have been too exhausted to push him out without the chance to recoop a little. I am all for all-natural, but if things are getting overwhelming, there’s no shame in getting a little help! No matter how you slice it, you get to take your baby home at the end. You’re going to do great! I’m in total agreement…..23 hours is a long time to be in labor!! If mine is shorter and somehow bearable I will try to stay away from drugs/intervention….if not….epidural will certainly be a big relief!!! You are right, the end result, a happy healthy baby is what to hope for!